Srinagar: The residents of Mir-Mohalla, Salia Panchal Pora, Naghbal in south Kashmir’s Islamabad district blamed the authorities for failing to provide basic amenities to them. As one enters into the hamlet, the first thing that catches one’s attention is a dilapidated and muddy road leading towards the hamlet. A closer look reveals how the villagers manage the acute scarcity of water, erratic power supply and a proper road facility to the village. “It seems we still live in the Stone Age,” said Ghulam Rasool Mir, a local Awqaaf head. “The roads in our area are in complete shambles and even a small downpour inundates the villagers,” Mir added. “These roads turn muddy during rainy season thereby making the movement of vehicles and pedestrians difficult,” he said. The inhabitants said due to the bad road conditions, the vehicles as well suffer extensive damage every year, and particularly the school children are facing a tough time to reach their school through the muddy road. “We all feel so ashamed when a guest visits to our area,” another resident Bilal Ahmed Mir said, due to the crisis our relatives too are not visiting our area, as once they enter to the hamlet they get drenched into the mud. 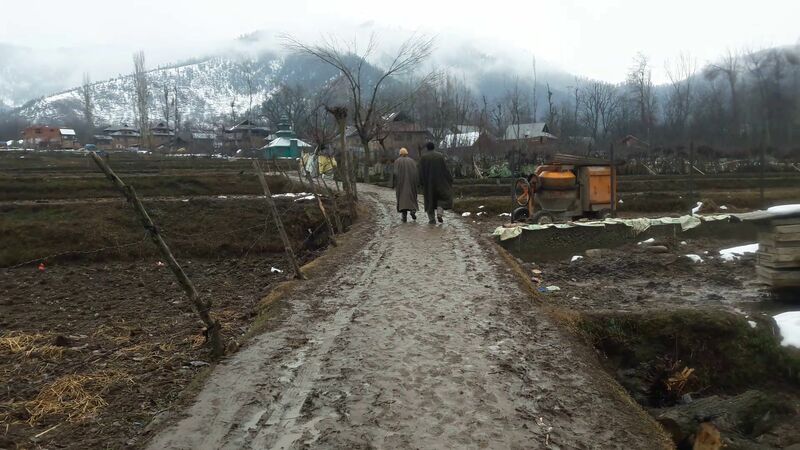 The inhabitants said that with little rains and snow during the past one week, the only link road connecting the hamlet with the main road Naghbal have turned muddy and the commuters are facing hell like situation as they are unable to traverse through the waterlogged, muddy road. Particularly, the school students are facing a tough time as they have to leave hours early to the school as the road takes time to reach on the main road. Despite repeated pleas by inhabitants, there were no initiatives taken by the authorities, the residents claimed. The road is bumpy and dotted with potholes, making the movement of vehicles and pedestrians difficult,” Mohammad Yousuf Mir, a local resident said. He said, during summer season this unpaved road becomes dusty, causing respiratory diseases in the area. They said the development of the village happened on papers only. The bad condition of roads keeps most of the transport vehicles away from the area, and the situation gets complicated when they have to ferry patients including expecting mothers to the district hospital. “Every day we are literally trekking to reach to our school. Because of the pathetic road conditions we are reaching late to school. Therefore, officials should look into the issue and immediately take steps to construct a road to our area,” said the agitating high school student. Commenting on this, the National Conference MLA Mohammad Altaf Kaloo who represents Pahalgam constituency while talking to this reporter said that the tender for the said road is already out and work will be started within a couple of days. “The work will be started within a couple of days as the tender by the R&B department is already out,” Kaloo said.